The heat wave that has settled on the province is creating problems for some crops and increase the risk of wildfires through most of the province. If you plan on making the most out of the hot weather in Saskatchewan this weekend, be careful about lighting any bonfires. Natural Resources Canada shows most of the southern part of the province is at an extreme or high risk for wildfires. The risk is lesser in areas of the province north of Prince Albert, with the risk returning to high around the Lac Brochet region. 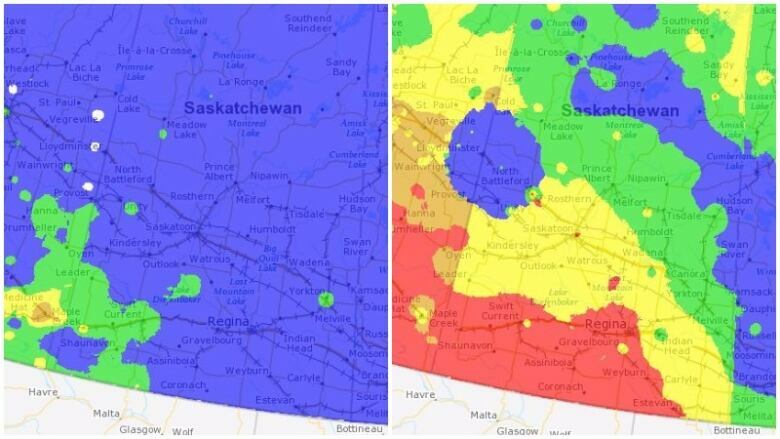 To illustrate just how hot temperatures have been as of late, a map of fire danger for this time last year showed the province was at a low risk. According to Environment Canada, temperatures will stay at around 30 C throughout the weekend and in the high 20s next week. The hot weather is also causing "stress" to some crops, particularly in the south, according to the province's latest crop report.